Very simply, outdoor misting fans combine an outdoor fan with mist cooling provided by water from a tank or hose. They can reduce dust and odors in the area, as well as static electricity and the presence of flying insects. They can help regulate humidity, but most of all, they can cool you off. In a hot, dry area, evaporative cooling in any form can cool the air by up to 30°. You can learn more about how the weather affects the cooling effect at our weather page. Add the cooling effect of the fan itself, and there is the potential for some serious cooling. Have you noticed how cool you feel when you step out of a bath or shower? That cooling effect comes from the water evaporating from your skin. Have you noticed how extra cool you feel when you step out of the shower with a window open, or a pool on a windy day? That extra cooling comes from the water evaporating from your skin plus the breeze. That is the kind of cooling potential you get with outdoor misting fans. Oudoor misting fans are more portable than a misting system and can take up less space than a swamp cooler — other kinds of evaporative coolers that we talk about on other pages. And outdoor misting fans offers a more targeted area of cooling (“spot cooling”) than either one, though multiple fans can be set up to cool targeted areas. They use less energy than a portable air conditioner, and can provide more cooling than a basic outdoor fan. To see how outdoor misting fans stack up against other outdoor cooling solutions, visit our comparison page. Outdoor misting fans are a newcomer to the outdoor cooling category. They may have first been brought to the pubic’s awareness in the 1990s at the sidelines of professional sports, keeping the athletes cool. Images of highly trained athletes suited up in layers of sports gear, performing at their peak in the blistering heat is enough to make anyone sweat, or at least appreciate being able to watch in the comfort of an air conditioned building. And seeing them run over to stand in front of a powerful mist-blowing fan to cool off enough to go do it again and win the game will definitely get your attention. 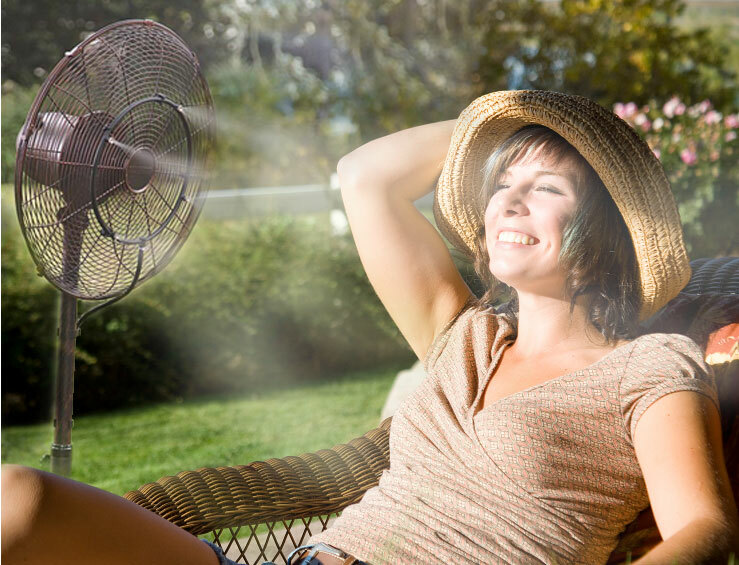 If outdoor misting fans can help in those punishing conditions, what could one do for you? The higher the water pressure used and the more powerful the fan, the more effective the cooling in both dry and humid weather. The superfine mist created by the high pressure and tiny nozzles evaporates mid-air, cooling the air immediately in front of the fan. Then the fan moves the cooled air out on its breeze. Less powerful fans can still provide a lot of cooling. The lower the water pressure, the less water will evaporate. As less water evaporates into the air, there will be less chilled air for the fan to move. But you will still feel some cooling from the breeze created by the fan. More powerful fans can move some of the un-evaporated water of a lower pressure mist. If some of this “wet” mist lands on you, you’ll still feel some cooling from the water evaporating from your skin combined with the fan’s breeze. As the water pressure goes down you’ll need to be closer to the fan to get this effect. So is the best solution to get the most powerful fan with the highest water pressure? Not necessarily. If you’re relaxing out on your patio, you really won’t want one of those high power systems practically blowing you and your stuff into the neighbor’s yard! And if you’re playing or working hard out on a field, the gentle breeze and small mist of a low power fan probably won’t be enough to cool down you and your whole group. the fan — how strong of a breeze can it make? the mist — can you get by with getting a little wet and cool a smaller area, or do you need total evaporation for a larger area? If possible, read comments from others who have used that fan or others like it. Contact the seller or manufacturer with any questions before you buy. The fan is the backbone of an outdoor misting fan. It supports the lines and nozzles of the mist system. It blows the mist. When the air is too humid for cooling from the mist to be effective, the fan alone can provide needed cooling. So look for a fan that creates a good air flow. Outdoor misting fans are great for spot cooling because they cool the area immediately around them. If you’re in an open field or an open patio, you’ll want to put the fan where you need it most and plan your activities right around it, especially if it uses a low pressure mist. If you’re outdoors playing or working hard and can’t put the fan right where you’re working or playing, take occasional breaks to go over to the fan and bask in the cool breeze. You’ll probably want a more powerful fan if you’re working or playing hard than you’ll want if you’re just relaxing. You can also cool down a partially enclosed area like a patio or tent with one to three closed sides. The measurement of a fan’s air flow (CFM / CMM — “cubic feet per minute” / “cubic meters per minute”) can really help you figure out how much cooling you’ll need for a more enclosed area. Manufacturers that have measured their outdoor fans for CFM/CMM will gladly display this information. The amount of CFM needed to cool an area is about 3 to 4 times the area. For example: If you're holding an outdoor event for 10 people in a tent that's 10' x10' x10' (1,000 cubic feet), you'll need an outdoor fan with about 3,000 to 4,000 CFM. In international measurements: If you're holding an event for 10 people in a tent that's 3m x 3m x 3m (27 cubic meters) you'll need an outdoor fan with about 81 to 108 CMM. The quality of the mist depends largely on the amount of water pressure used for the misting system. The misting system is basically made up of the water lines and nozzles and an optional pump. The higher the water pressure the finer the mist and the more completely it will evaporate. It’s this complete evaporation that provides the most cooling. Some water droplets of a low pressure system might not evaporate completely. Some droplets will even fall to the ground and can leave a wet spot or puddle. This means less water in the air and less evaporative cooling. Hose fed outdoor misting fans work with the low pressure of a typical current provided by your water company, usually less than 120 psi (pounds per square inch). These are often called patio misting fans and are great to use near your house. Mid pressure systems will be in the range of 300-500 psi, and the most effective evaporation will be in the 1000 − 1200 psi range of a high pressure system. Mid and high pressure systems use a pump to increase the water pressure. Many outdoor misting fans have a water tank that lets you use the fan even where a hose isn’t available. The water needs some degree of pressure just to draw it up into the lines and out the nozzles. These fans need at least a low pressure “booster” pump (up to 200 psi). You can probably estimate about 50-100 psi (similar to a household water current) to draw up the water. A typical 200 psi pump would leave you with about 100-150 psi for the actual mist — equivalent to a low pressure system. Outdoor misting fans fed by water tanks are also available with mid and high pressure pumps. If an outdoor misting fan uses a pump to create a very fine, effective mist, you can be pretty sure it will be mentioned in the product description, and it will be reflected in the price. If a fan’s product description doesn’t mention a pump or tell you the water pressure, you should assume it works with low water pressure and provides a lower degree of evaporative cooling. Your best assurance of the most effective mist cooling is a misting fan’s use of a mid- or high-pressure pump. People sometimes want to avoid the use of a pump. Pumps add to the cost, weight, and noise of outdoor misting fans and require some maintenance. But because they increase the mist’s cooling ability so dramatically, many people want a pump once they understand how it impacts the quality of the mist. To use multiple fans you may need a pump. The water to EACH fan needs enough pressure to push the water up through the lines and out the nozzles. Dividing the water from one source to supply multiple fans can lower the water pressure to each fan. If you don’t want the water dripping out of the nozzles, it might be a good idea to get a mid or high pressure pump, lines, and nozzles. A high pressure pump of 1000 psi would divide the pressure among several fans without a crippling drop in pressure. To learn more about pumps that work with misting systems, visit our section on misting pumps. Flush out the water lines before the first use. This will get rid of any debris that could clog the nozzles before you ever use the fan. Set up the fan in an area where any puddling or wet mist won’t cause any damage. Set a standing fan up on a level, even surface in a location where it won’t get tipped over. Be sure nothing obstructs the airflow. The more debris and minerals in your water, the more the nozzles will clog. A water filter can cut down on this. Clogs can be cleared on larger nozzles with a pin. Smaller nozzles can be soaked in a cleaner that will dissolve the deposits. Be aware breezes will have an effect. You can help your fan by pointing it in the direction of any breezes. A soft breeze can extend the distance of air flow. A strong breeze can overpower it. Breezes may have more effect on the fine mist of a high pressure fan than on a low pressure fan. Humidity can also affect the cooling distance. Generally, the more humid the weather, the less “reach” the mist will have and the less cooling effect water evaporation will have. Drier weather is best for outdoor misting fans and will allow the mist to travel further. With low pressure fans, you may find that adjusting the water pressure will have an effect on the kind of mist you get. With the water on full blast you may find the mist wetter with more puddling or vice versa. Try turning the water up or down to see how that affects the quality. Outdoor misting fans must be rated for outdoor use. No matter how “dry” the mist might be, moisture can get into the fan motor. Any fan to which you add a misting kit also must also be rated for outdoor use. Many of an outdoor misting fan's features are just like other joutdoor fan features. But some are more specific to outdoor misting fans, and we list those here. Low pressure misting fans typically run very quietly. The mist system will create no noise to speak of, and the low to mid power fans generally have rather small, quiet motors. Running them on lower speeds can keep the noise level to a minimum. These are great to use in more intimate settings. More powerful fans and those that use mid- and high pressure pumps will naturally be louder as the power increases. The most powerful ones can be quite loud. These may be best set back from main activities and used as a “cooling zone” where people can take occasional breaks to cool off. These are the kinds you might see on the sidelines of a sports field. Drain valves allow any water to drain out of the lines and nozzles when the unit is turned off. This helps prevent clogging by reducing mineral build-up from any standing water. An "optional mist" feature lets you turn off the mist and run the fan by itself. This can save water and energy. If your weather grows more humid you’ll get less of a cooling effect from the mist. Turning it off means you don’t add even more humidity to the air, and you’ll still be able to get a lot of cooling from the fan. The product descriptions of outdoor misting fans that use water tanks will let you know how many gallons of water they use per hour (GPH). When combined with the size of the water tank you can estimate how long you’ll be able to run the mist before needing to refill the tank. Water tank fans will typically include an automatic shut off valve that shuts off the water pump when the tank is out of water. This protects your pump from any damage from overheating. Hose fed misting fans use about 1/2 gallon of water per hour. One of the first things that can affect the smooth running of outdoor misting fans is a clog created by minerals in the water. Some fans an almost all pumps come with a water filter included, which will need to be replaced from time to time. You can also purchase a water filter separately. Look for filters that will screen out large sediment particles that can clog water lines and damage pumps. Also look for filters that will trap superfine calcium particles that can get up into the nozzles and clog them. Many fans have a simple cage that creates a safe space around the fan blades. Some fans also have a shroud, which is a barrier that looks like a frame encircling the cage and blades. This shroud helps direct the air and mist flow and ensures the cool air doesn’t drift off toward the sides of the fan. The cool air stays more concentrated in the area in front of the fan blades. If you want the cool air to drift around the area of the fan you won’t want a shroud. But if you want concentrated cooling in one focused area a shroud can help you achieve that. 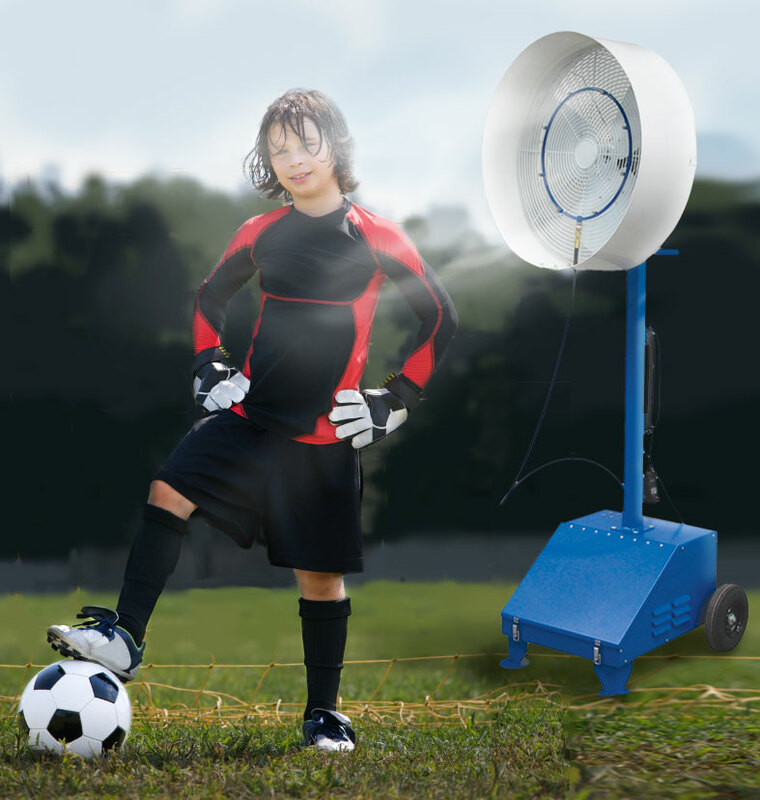 These simple kits allow you to turn your ordinary outdoor rated fan into a misting fan. These kits contain the water line, nozzles and nozzle ring, a connector to a hose or tank, and plastic ties. You simply tie the nozzle ring onto the cage in front of your fan’s blades, connect it to a water source and turn it on. You can find versions that have flexible nozzle rings — low cost. The ring can twist, changing the direction of the mist, so you'll need to check it from time to time. These typically work with the low pressure of a garden hose or booster pump (up to 200 psi) of a tank fed misting fan. More durable and more expensive are metal rings that don’t twist and will last for many years. These can work with any water pressure. Outdoor misting fans are typically designed for function over aesthetics. Corrosion resistant finishes, aluminum and heavy duty plastics stand up to the outdoors. Lightweight materials and construction mean you can move the fan wherever it needs to go. A misting fan used in a garage, warehouse, or park doesn't usually needs to look great. But low pressure patio misting fans are often designed with more consideration of their appearance since these are usually used around the home. A few manufacturers, such as DecoBreeze, have created some beautiful designs specifically to complement your decor. Low pressure outdoor misting fans are lightweight and can be moved from front to back yard, from one side of the yard to another. Their light weight makes it easy to fine tune the location, moving them a couple of feet closer or further away. Although they're pretty easy to move around, the lightest ones may also be likely to tip over. These may need weights on the base or to be positioned out of the way or in a protected area. Outdoor misting fans that use a water tank free you from a water hose. In fact, if you use a generator to supply electricity, you can take these almost anywhere. But tanks and generators add weight. If the fan has a high pressure mist there will be the added weight of the pump. You may have to fill the tank before moving the fan, so just be aware the added water can make the fan's sytem very heavy. Most tank fed misting fans already include wheels or carts that allow for easier transport of these fans and their supplies. If your fan doesn't have these a separate dolly or cart can be invaluable. Care of outdoor misting fans is pretty simple. Unplug it, drain it, cover it, bring it indoors when not in use. Part of being built for outdoor use is corrosion-resistant materials and finishes that stand up to outdoor environments. But keeping them covered or bringing them indoors when not in use for awhile will keep them looking and functioning their best for as long as possible. The mist lines and nozzles should be drained and cleaned from time to time to prevent mineral buildup that can cause clogging. Occasionally check for leaks. If your fan uses a pump you’ll want to take good care of it. A well-maintained pump can last for years. Basic pump maintenance involves changing its oil and filter from time to time. Some pumps will need additional maintenance. For example, their seals may need to be inspected and replaced, if necessary. Other pump features, like valves, switches, and regulators also need to be checked regularly and either cleaned or replaced. Your fan will come with a maintenance manual that will tell you exactly how and when to do these simple tasks. Solid information about outdoor misting fans can be hard to find. Sellers may describe the fan component in detail. But information about the quality of the mist system and how it works with the fan is almost non-existent. You might feel you’ve hit the jackpot if you come across a crumb of marketing text that says, “dry mist.” But with little definition of the term and nothing to back up that claim (such as the use of a pump), you could end up with a puddle on the floor and little cooling from the mist. Remember, if a fan’s product description doesn’t mention a pump or tell you the water pressure, you should assume it works with low water pressure and provides a lower degree of evaporative cooling. Also, performance and satisfaction with the product can be subjective. Your weather and the way the outdoor misting fans are set up can affect their performance. The quality of the mist might bother you but be fine for someone else. You may find that comments from people who have used the product or others like it will be especially helpful to you. If you’re not sure about a certain product, it can be really helpful to read what others have said about it. It can also give you peace of mind to contact the seller or manufacturer with any questions before you purchase. Especially since some of the more powerful fans can get expensive. Many makers and sellers of outdoor misting fans want you to be comfortable with your purchase and know that a happy customer is good advertising.